Ecotours in DeLeon Springs State Park deliver Old Florida experiences with nature. Photo by Cultural Heritage TravelingMom Christine Tibbetts. 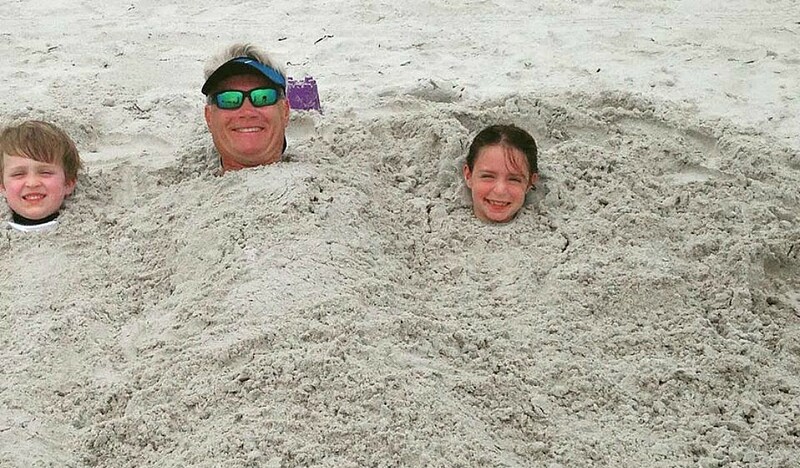 Famous Florida attractions create great vacations, but why not try something different? Like swim in crystal blue waters. Cruise the St. Johns River spotting birds and ’gators. Cook pancakes in an old sugar mill. 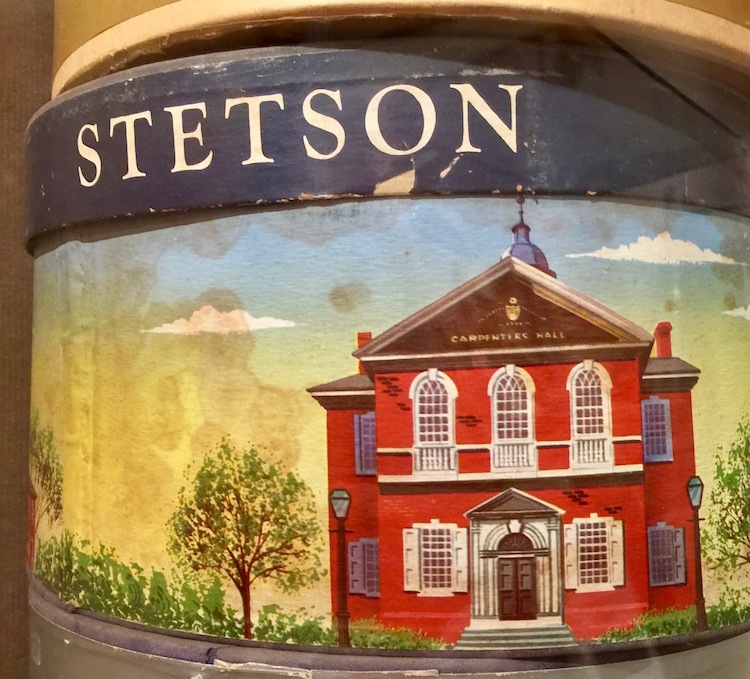 Cultural Heritage TravelingMom loves modern Daytona but set out for nearby DeLand instead to find out if Old Florida is still there, and where new vibes fit in. 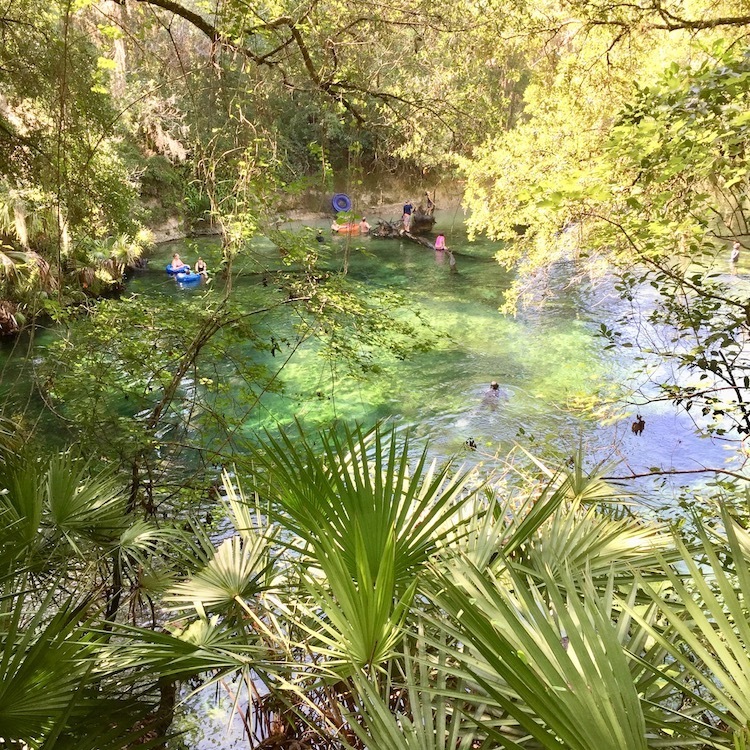 Experiencing Old Florida near DeLand can mean getting right in the water at Blue Spring State Park. Photo by Cultural Heritage TravelingMom Christine Tibbetts. Gotta go there images never used to pop in my head for Florida vacations in a town named DeLand and a county called West Volusia. That’s Old Florida and my friends talk about new stuff. So I set out to seek new memories in Old Florida, and figure out things to do in and near DeLand. Think midway between Orlando and Daytona. These six discoveries created gotta go there images which now linger. Consider them starter ideas, fun for families and adult travels. 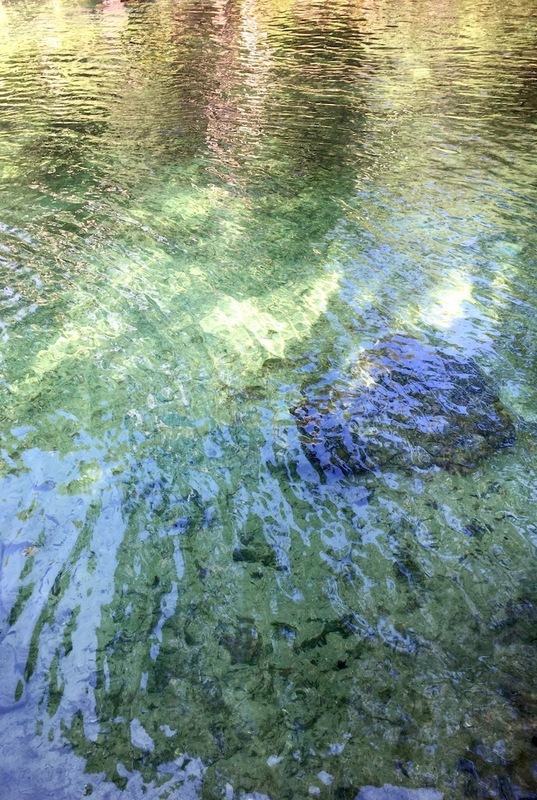 Manatee warm up in the waters of Blue Spring State Park, and people cool down. Constant 72 degrees serve each species differently. Lots of visitors kayak or float in big yellow tubes. Why so cold in a hot state? Water gushes in daily, 104 million gallons every day. If you’re not up for dipping in, the half-mile mile boardwalk parallels the water, smooth with handrails, welcoming wheelers and strollers. Old Florida offers reflections of the past with natural waters and wildlife. In Blue Spring State Park, clouds and trees reflect in the waters creating double images just right for daydreaming while leaning on the boardwalk railings. 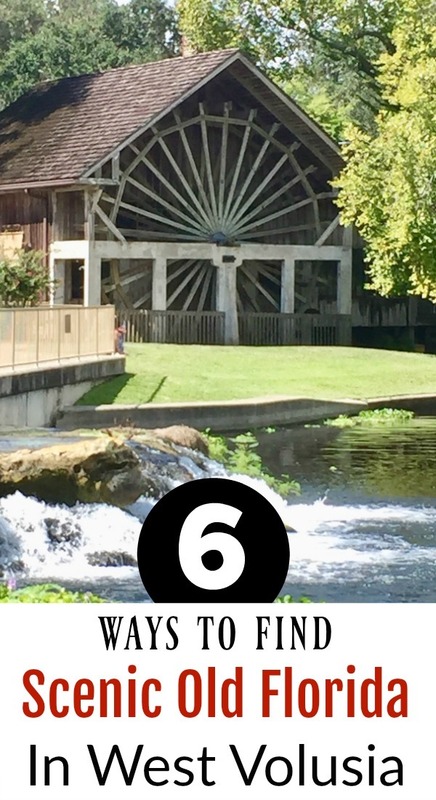 Six are but a few of the ways and reasons to discover Old Florida in new DeLand. That’s also known as West Volusia County, not far from Daytona. Photo by Cultural Heritage TravelingMom. “My roots are very deep here,” says Patti Schwarze. And she’ll tell you how deep at the Old Spanish Sugar Mill in DeLeon Springs State Park. Her restaurant is a century-old replica of an 1830s mill. Meeting people with roots means they care about the place you are visiting. For me, that turns into better-than-average experiences. Test that notion with Schwarze while you pour batter on a hot grill built in to your table. She’s lived her whole life here and she’s as much in charge as in love with the park and the cook-yourself pancakes she invites travelers to experience. 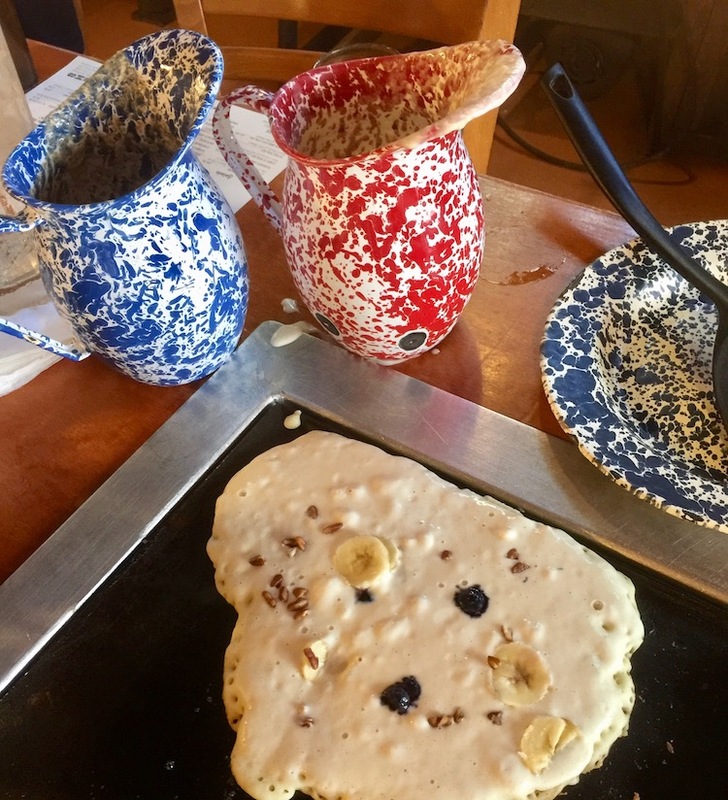 Pour up your own pancakes at the Old Spanish Sugar Mill in DeLeon Springs State Park. Photo by Cultural Heritage TravelingMom Christine Tibbetts. T. Thomson and Michael Solari offer up a remarkable local experience too. Hope they’re home when you visit. Now that’s unusual and so is the 1886 Stetson Mansion which they purchased in 2005. Touring the home of the famous hat magnate is more personal than museum visiting because it really is their home. Keep your eye on 16 patterns of parquet floor, 10,000 panes of leaded Venetian glass, extensive crown molding and elaborate wainscoting. Bird watching’s an old Florida pleasure and a new one. 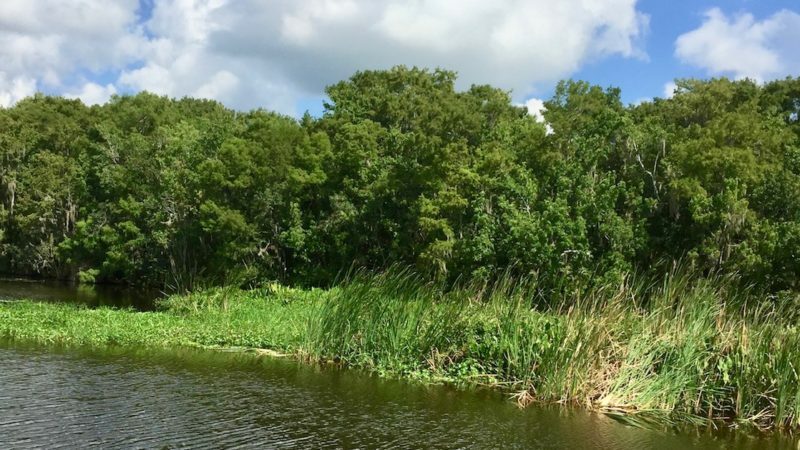 Make it easy on a boat with a guided eco-tour on the St. Johns River. Hop aboard this one right after an Old Sugar Mill pancake breakfast. I usually pretend to see what birders point out rather than ‘fess up I don’t see and disappoint us both. On the Fountain of Youth Eco/History Tour out of DeLeon Springs State Park, I actually saw birds. Five thousand years ago, the native Americans here no doubt saw lots more but the boat guides are good and tree branches wide. Strong possibility to spot wood storks and mottled ducks, anhinga and white pelicans, bald eagles and Sandhill cranes. Herons too. Reflections in state park waters near DeLand in West Volusia County create works of art. Photo by Cultural Heritage TravelingMom Christine Tibbetts. The first people in what’s now West Volusia County were called the Timucua and they considered the waters to be a river of lakes. Welaka was their word. Today River of Lakes Heritage Corridor also means connecting to towns with their museums, galleries, theaters and restaurants. Think West Volusia County and MainStreet DeLand when plotting a course. 5. Main Street DeLand: Old Florida Or New Vibes? Let go of the notion little downtowns struggle with shop closings and limited dining. Downtown DeLand is 100% full of independently owned businesses, and that means theaters and museums too. Expect art with 14 distinctive murals – not advertising style but real art, a sculpture walk with professional commissioned works that change annually, and a Museum of Art. TravelingMom Tip: Pick up self-guided walking brochures for all the art and download the Florida Humanities Council “Walk DeLand” app to hear to hear Florida stories of dreamers and adventurers who built this town. Of course, it’s hard to decide which eateries to try on vacation. Great Tasting Tours in DeLand makes overview tasting possible with walking tours. 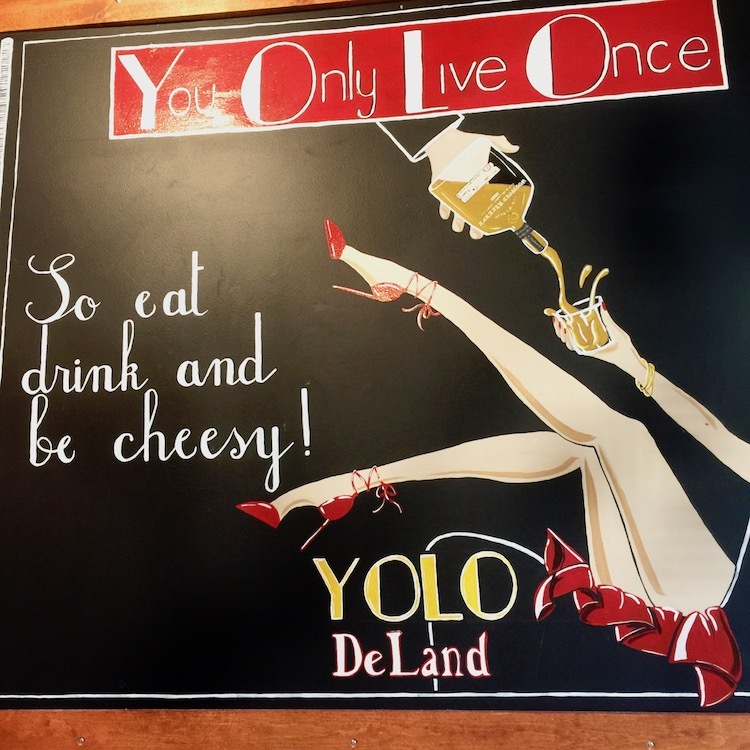 Sip and browse and savor become ways to check out new vibes in Old Florida in DeLand with Great Tasting Tours. Photo by Cultural Heritage TravelingMom Christine Tibbetts. I tried Brews & Browse, making eight stops on a comfortable guided stroll with history and commentary along the way. Food and drink distinguished six places, a selfie photo-op with art another and a musical interactive experience with hand-made drums at the other. Assuming the Sweet & Savory tour and the Sip & Shop are equally distinctive, Great Tastings strikes me as the right way to experience lots in an afternoon. Don’t miss the plantain soup with green onion; it’s memorable. 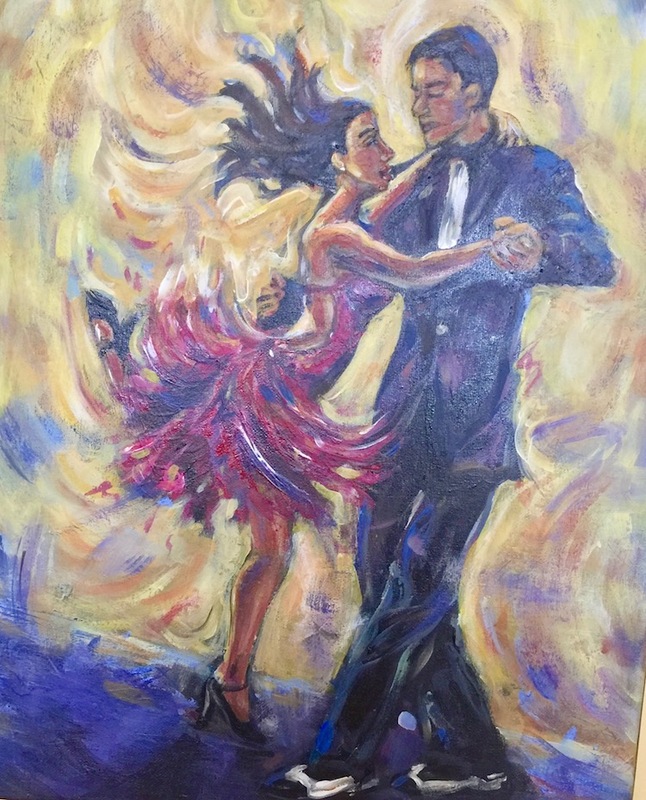 Latin fusion is the description of the menu, and should about be the décor too with vibrant art of salsa dancers and portraits of Diego Rivera and Frieda Kahlo. Tapas is the right order I think because the portions are sensible and the colors and presentation gorgeous. Art gallery walls add zest to the already memorable Latin fusion restaurant in MainStreet DeLand. Photo by Cultural Heritage TravelingMom Christine Tibbetts. Twin brothers operate across-the-street restaurants. Brick House belongs to Frank Jennings and I experienced the best, and most beautiful, mussels ever there on my walking tour, plus Prohibition-era action photography. Bill Jennings is in charge at Byte with a casual feel but more upscale menu. My Pasta Bucatini with artichokes, sundried tomato pesto, arugula and anchovy crumbs was superb. The two sides I chose really weren’t necessary but I wanted to check them out: roasted Brussels sprouts and beets with goat cheese crème. Divine. Finding Old Florida elsewhere in the state also pleases Empty Nest TravelingMom Cindy Richards. Cultural Heritage TravelingMom almost tried skydiving experiences in DeLand, and discovered more to do beyond the obvious in nearby Daytona. We enjoyed having you on our Great Tasting Tour. Come back and visit us again anytime.